100% Organic Natural Basil Leaves. McCormicks Sweet Basil is harvested just before flowering and is 100% organic, delivering all - natural goodness. Sweet Basil's green, slightly minty flavor and fragrant bouquet has underlying tones of clove, and allspice, which may remind one one of finely steeped tea. Sweet and fragrant basil complements tomato-based recipes including pizza, pasta and marinara sauce. 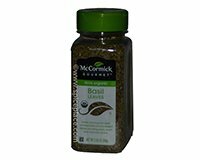 McCormick Organic Basil is part of the McCormick line of premium, 100% organic herbs and spices that deliver all-natural goodness, wholesome flavor, while helping to preserve our earth for generations to come. This product is 100% organic and delivers all-natural goodness, while preserving our great earth. McCormick 100% Organic Basic is of the highest quality. Ingredients: Organic Dehydrated Basil Leaves.